The slogan on the yellow buttons was catchy — “We’ll Have Nun of This” — and a point of protest was made at a morning rally March 23 on the steps of the Cathedral Basilica of SS. Peter and Paul in Philadelphia where about 100 people came to support the nuns in question, the Little Sisters of the Poor. The religious congregation operates free homes for the indigent aged through the country and the world, including Holy Family Home in West Philadelphia. The rally, conducted by a group called Women Speak for Themselves in conjunction with the Archdiocese of Philadelphia’s Office for the New Evangelization, was objecting to the “HHS mandate,” the U.S. Department of Health and Human Services regulations under the Affordable Care Act that require employers to provide health insurance including contraception. While such groups as the Little Sisters, the Catholic dioceses of Pittsburgh and Erie and Catholic Charities organizations, are not required to directly include contraceptive coverage, according to the federal HHS they must report the names of exempted employees to the government, which would then arrange for the coverage. The Little Sisters and the other appellants argue this reporting mandate makes them complicit in supplying a service that is against their religious beliefs. 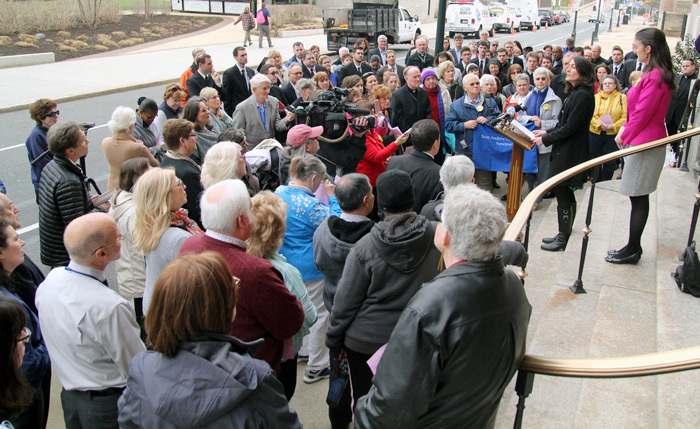 At the precise time of the rally at the cathedral, 10:30 a.m., the United States Supreme Court was conducting oral arguments on the case concerning the health insurance plans of church affiliated agencies, including the Little Sisters. There was also a recitation of the very appropriate Chaplet of Divine Mercy and a collection of personal care items for the residents of Holy Family Home. After the rally about 10 representatives of Women Speak for Themselves continued the day with an afternoon of direct service to the residents at Holy Family Home, according to Megan Schriever, a local spokesperson who said the Philadelphia event was one of 19 conducted nationally including one in Washington at the Supreme Court. “It doesn’t break the leg of the Little Sisters, but it picks their pocket,” she said.